Pechengsky District (Russian: Пе́ченгский райо́н; Finnish: Petsamo; Norwegian: Peisen; Northern Sami: Beahcán; Skolt Sami: Peäccam) is an administrative district (raion), one of the six in Murmansk Oblast, Russia. As a municipal division, it is incorporated as Pechengsky Municipal District. It is located in the northwest of the oblast, on the coast of the Barents Sea (by the Rybachy Peninsula, which is a part of the district) and borders Finland in the south and southwest and Norway in the west, northwest, and north. The area of the district is 8,662.22 square kilometers (3,344.50 sq mi). Its administrative center is the urban locality (an urban-type settlement) of Nikel. Population: 38,920 (2010 Census); 46,404 (2002 Census); 59,495 (1989 Census). The population of Nikel accounts for 32.8% of the district's total population. The area was long-inhabited by the indigenous Sami people. The borders of the land between Norway and Russia were not defined in terms of land, but, according to the Treaty of Novgorod (1326) the border zone was defined by whom the different indiginuous, nomadic families had to pay their taxes to. In 1533, the settlement of the Pechenga Monastery was defined as part of Russia. The settlement of Pechenga was founded as the Pechenga Monastery in 1533 at the influx of the Pechenga River into the Barents Sea, 135 kilometers (84 mi) west of modern Murmansk, by St. Tryphon, a monk from Novgorod. Inspired by the model of the Solovetsky Monastery, Tryphon wished to convert the local Skolt Sami population to Christianity and to demonstrate how faith could flourish in the most inhospitable lands. The area was resettled by the Pomors and other Russians. The present border between Norway and Russia was settled in 1826, and the development of the area considerably accelerated in the late 19th century, when the monastery was re-established there. The harbor of Liinakhamari in Petsamo was important for the Russian economy during World War I as the Baltic Sea was blocked by the Germans. In the 1920 Treaty of Tartu, Soviet Russia ceded the area of Pechenga (Petsamo Province) to Finland. Deposits of nickel were found in 1921, after Petsamo became a part of Finland. In 1934, the deposits were estimated at over five million tonnes. Mining operations were started in 1935 by Canadian and French corporations. Construction of a road from Sodankylä through Ivalo to Liinakhamari started in 1916 and was completed in 1931. This made Petsamo a popular tourist attraction, as it was the only port by the Barents Sea reachable by automobile. The green area was the Finnish part of the Rybachy Peninsula, formally ceded to the Soviets after the 1939–40 Winter War. The yellow area was ceded to the Soviets in the 1944 Moscow Armistice. The red area is Jäniskoski, which Finland sold to the Soviet Union in 1947. 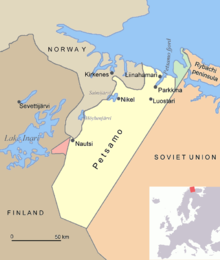 In the Winter War of 1939–1940, the Soviet Union briefly occupied Petsamo. In the following peace agreement, the Rybachy Peninsula, with the area of 321 square kilometers (124 sq mi), was the only part of Petsamo ceded to the Soviet Union, although the Soviets had occupied all of Petsamo during the Winter War. 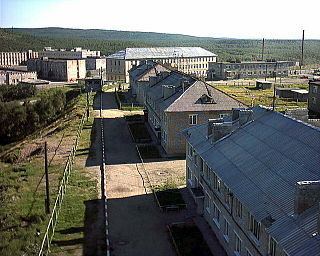 In 1941, during World War II, Petsamo was used by Nazi Germany as a staging area for the offensive towards Murmansk. In 1944, the Red Army occupied Petsamo again, and this time Finland had to cede it to the Soviet Union as part of the Moscow Armistice signed on September 19, 1944; the total ceded area was 8,965 square kilometers (3,461 sq mi). On July 21, 1945, the Presidium of the Supreme Soviet of the Soviet Union decreed the establishment of Pechengsky District with the administrative center in Nikel on the ceded territory and to include this district as a part of Murmansk Oblast. In 1947, Finland exchanged the remaining 169 square kilometers (65 sq mi) Rayakoski area, together with the Jäniskoski hydroelectric plant, for Soviet-confiscated German investments in Finland. Following the Paris Peace Treaty, the local Skolt Sami were given the choice of staying in Soviet Russia or moving to Finland. Most opted to re-settle in Finland. When Polyarny District was abolished on July 9, 1960, a part of its territory was transferred to Pechengsky District. On December 26, 1962, when the Presidium of the Supreme Soviet of the RSFSR decreed the reorganisation of the Soviets of People's Deputies and the executive committees of the krais, oblasts, and districts into the industrial and agricultural soviets, Murmansk Oblast was not affected and kept one unified Oblast Soviet and the executive committee. Nevertheless, on February 1, 1963, the Decree by the Presidium of the Supreme Soviet of the RSFSR established the new structure of the districts of Murmansk Oblast, which classified Pechengsky District as rural. However, this classification only lasted for less than two years. The November 21, 1964 Decree by the Presidium of the Supreme Soviet of the RSFSR restored the unified Soviets of People's Deputies and the executive committees of the krais and oblasts where the division into the urban and rural districts was introduced in 1962, and the districts of Murmansk Oblast were re-categorized as regular districts again by the January 12, 1965 Presidium of the Supreme Soviet of the RSFSR Decree. The district is important for its ice-free harbor, Liinakhamari, and the deposits of nickel. Мурманская областная Дума. Закон №539-01-ЗМО от 2 декабря 2004 г. «О статусе, наименованиях и составе территорий муниципального образования Печенгский район и муниципальных образований, входящих в его состав», в ред. Закона №1156-01-ЗМО от 23 ноября 2009 г «Об упраздении некоторых населённых пунктов Мурманской области и внесении изменений в отдельные законодательные акты Мурманской области». Вступил в силу 1 января 2005 г. Опубликован: "Мурманский Вестник", №234, стр. 3, 7 декабря 2004 г. (Murmansk Oblast Duma. Law #539-01-ZMO of December 2, 2004 On the Status, Names, and Composition of the Territories of the Municipal Formation of Pechengsky District and of the Municipal Formations It Comprises, as amended by the Law #1156-01-ZMO of November 23, 2009 On the Abolition of Several Inhabited Localities of Murmansk Oblast and on Amending Several Legislative Acts of Murmansk Oblast. Effective as of January 1, 2005.). Совет депутатов муниципального образования Печенгский район. Решение №234 от 26 января 2006 г. «Устав муниципального образования Печенгский муниципальный район Мурманской области», в ред. Решения №165 от 10 декабря 2010 г «О внесении изменений в Устав муниципального образования Печенгский район Мурманской области, принятый Решением Совета депутатов муниципального образования Печенгский муниципальный район от 26.01.2006 №234, с изменениями от 10.03.2006 №246, от 05.05.2006 №40, от 14.11.2008 №396, от 30.10.2009 №542, от 18.06.2010 №67, от 17.09.2010 №94». Вступил в силу в соответствии с пунктами 1 и&nbps;2 статьи 69. Опубликован: "Печенга", №57, стр. 1–6, 27 мая 2006 г. (Council of Deputies of the Municipal Formation of Pechengsky District. Decision #234 of January 26, 2006 Charter of the Municipal Formation of Pechengsky Municipal District of Murmansk Oblast, as amended by the Resolution #165 of December 10, 2010 On Amending the Charter of the Municipal Formation of Pechengsky District of Murmansk Oblast, Adopted by the Decision of the Council of Deputies of the Municipal Formation of Pechengsky District No. 234 of January 26, 2006, revised by No. 246 of March 10, 2006, by No. 40 of May 5, 2006, by No. 396 of November 14, 2008, by No. 542 of October 30, 2009, by No. 67 June 18, 2010, by No. 94 of September 17, 2010. Effective as of the date set forth by the provisions of items 1 and 2 of Article 69.). Президиум Верховного Совета РСФСР. Указ №741/18 от 9 июля 1960 г. «Об упразднении Полярного района, объединении Североморского городского и Териберского районного советов и переименовании Териберского района Мурманской области». Опубликован: "Ведомости ВС РСФСР", №25, ст. 371, 1960. (Presidium of the Supreme Soviet of the Russian SFSR. Decree #741/18 of July 9, 1960 On the Abolition of Polyarny District, the Merger of Severomorsk Town and Teribersky District Soviets, and the Renaming of Teribersky District of Murmansk Oblast. ). Luostari is a rural locality in Pechengsky District of Murmansk Oblast, Russia, located near the Norway–Russia border. Population: 2,260. Polyarnye Zori is a town in Murmansk Oblast, Russia, located on the Niva River, Lake Imandra, and Lake Pinozero, 224 kilometers (139 mi) south of Murmansk. Population: 15,096 (2010 Census); 15,910 (2002 Census); 19,428 (1989 Census). Lovozero is a rural locality and the administrative center of Lovozersky District in Murmansk Oblast, Russia, located on both banks of the Virma River, which is not far from Lake Lovozero, and 164 kilometers (102 mi) southeast of Murmansk, the administrative center of the oblast. Population: 2,871 (2010 Census); 3,141 (2002 Census); 3,638 (1989 Census). It is the second largest locality in the district after Revda. Rayakoski is a rural locality in Pechengsky District of Murmansk Oblast, Russia, located adjacent to the tripoint between Finland, Norway, and Russia. Population: 238. Kuropta is a rural locality in Kovdorsky District of Murmansk Oblast, Russia, located beyond the Arctic Circle at a height of 213 meters (699 ft) above sea level. Population: 90. Zhemchuzhnaya is a rural locality in Kandalakshsky District of Murmansk Oblast, Russia, located beyond the Arctic Circle. Population: 2. 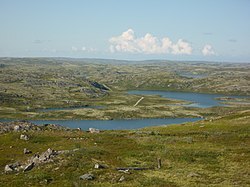 Kuoloyarvi is a rural locality in Kandalakshsky District of Murmansk Oblast, Russia, located north of the Arctic Circle at an altitude of 191 meters (627 ft) above sea level. It had no recorded population as of the 2010 Census. Prirechny is a rural locality in Pechengsky District of Murmansk Oblast, Russia, located beyond the Arctic Circle at a height of 163 meters (535 ft) above sea level. Population: 45. Vayda-Guba is a rural locality in Pechengsky District of Murmansk Oblast, Russia, located beyond the Arctic Circle on the Kola Peninsula at a height of 15 meters (49 ft) above sea level. Population: 94. Korzunovo is a rural locality in Pechengsky District of Murmansk Oblast, Russia, located beyond the Arctic Circle at a height of 63 meters (207 ft) above sea level. Population: 275. Titovka is a rural locality in Pechengsky District of Murmansk Oblast, Russia, located beyond the Arctic Circle. As of the 2010 Census the locality has a population of 1. Putevaya Usadba 9 km zheleznoy dorogi Luostari–Nikel is a rural locality in Pechengsky District of Murmansk Oblast, Russia, located beyond the Arctic Circle. Population: 0. Luostari is a rural locality in Pechengsky District of Murmansk Oblast, Russia, located beyond the Arctic Circle at a height of 62 meters (203 ft) above sea level. Population: 10. Ura-Guba, also known as Ura (Ура), is a rural locality in Kolsky District of Murmansk Oblast, Russia, located beyond the Arctic Circle at a height of 1 meter above sea level. Population: 517. Nyal is a rural locality in Kolsky District of Murmansk Oblast, Russia, located beyond the Arctic Circle. Population: 7. Kovdorsky District is an administrative district (raion), one of the six in Murmansk Oblast, Russia. It is located to the west of the Kola Peninsula. The area of the district is 4,066 square kilometers (1,570 sq mi). Its administrative center is the town of Kovdor. Population: 21,297 (2010 Census); 24,404 (2002 Census); 36,786 (1989 Census). The population of Kovdor accounts for 88.4% of the district's total population.